I Love Rock ‘n Roll … and Cliff Lede! This is why you wait. There are wines to be drunk young, and there are wines that need time. Too many people drink a beautiful bottle way too early. Okay, they bought it, they like it young, fine! But I do question if they KNOW what the wine will become if they just hold it for a few years. My husband and I just got back from Napa. We did our usual tour of some new (to us) wineries as well as hitting some of our favorites. 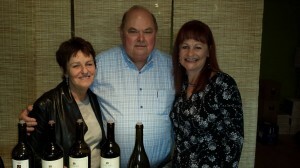 One of the favorites is Cliff Lede, who has great wine and a great tasting experience! Their tasting room is fun and cozy at the same time! The crackling fireplace is perfect on a chilly spring day. Add the fun wine pros, the great tunes filling the airwaves, the beautiful grounds full of rock and roll artwork and blocks named after Cliff Lede’s favorite rock n roll songs, and you’re in store for a very special time! We tasted some of their wonderful current releases and bought a few. 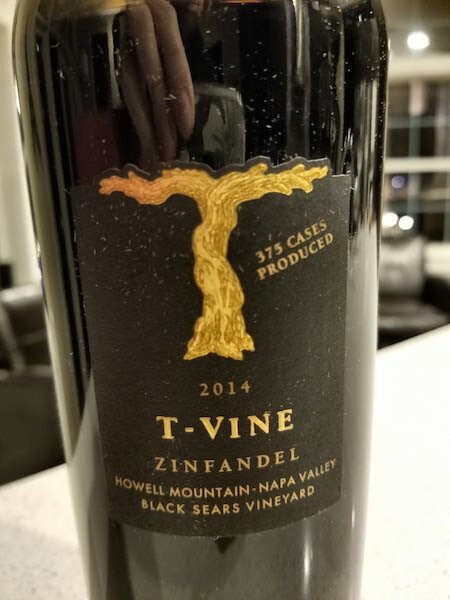 We also bought one of their library wines, and cracked it open tonight! 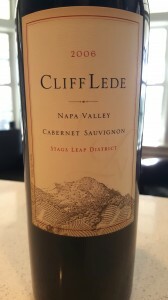 The 2006 Cliff Lede Stags Leap Cabernet Sauvignon is SINGING! I am in love with this wine! It still has lots of dark fruit and a velvety texture with smooth tannins. Prune, tobacco and a little spice lead to a nice long finish of dark chocolate. Oh, if only I’d bought a case. 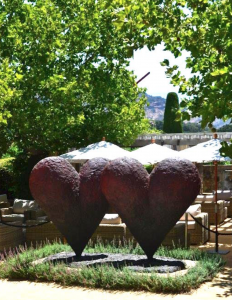 Definitely check them out the next time you’re in Napa. 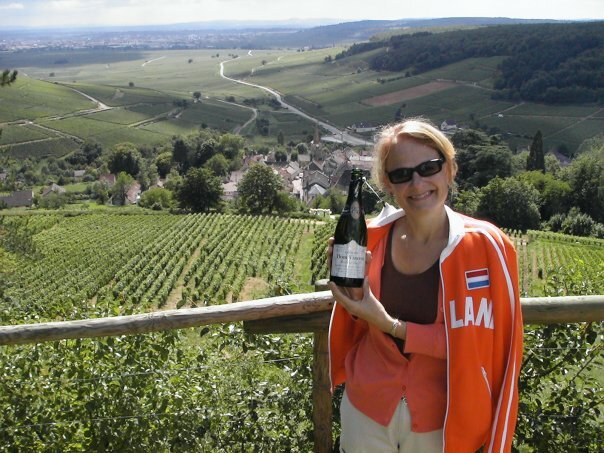 The tasting experience is special, and the wines rock! I’m a Right Bank kind of girl. Don’t get me wrong. I love the power and elegance of a great Cabernet Sauvignon and the wines of the Left Bank. There’s some reason, however, that I’ve always had a soft spot for the Right Bank. Is it because I can enjoy them earlier? Perhaps! I love the soft tannins and big fruit of Merlot. Plus, I seem to love to root for the underdog! And the Right Bank and their New World versions do indeed seem to be, for the most part, the underdog! 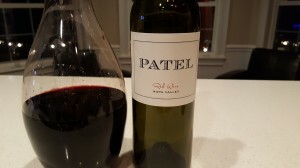 This Right Bank Bordeaux blend from Patel Winery in Napa Valley is right up my alley. The blend is 80% Merlot, 11% Malbec, 7% Cabernet Franc and 2% Petit Verdot. The nose screams cherry, cherry cherry! Okay, it’s not just cherry! There’s some subtle oak, a touch of leather and some big time floral aromas as well. 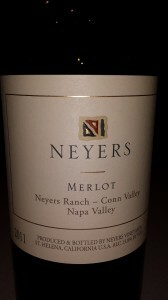 The velvety palate has black cherry and some other dark fruit, along with some spice and good acidity. 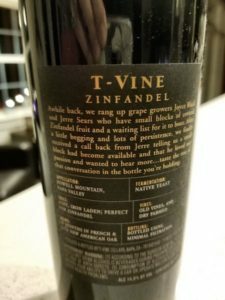 This is a great food wine (I want to try this with some Swiss fondue! ), but I also enjoyed a glass (or three!) sitting on my deck with a nice breeze, some great tunes, and my hubby and dogs! What Vintage Are YOU Celebrating? 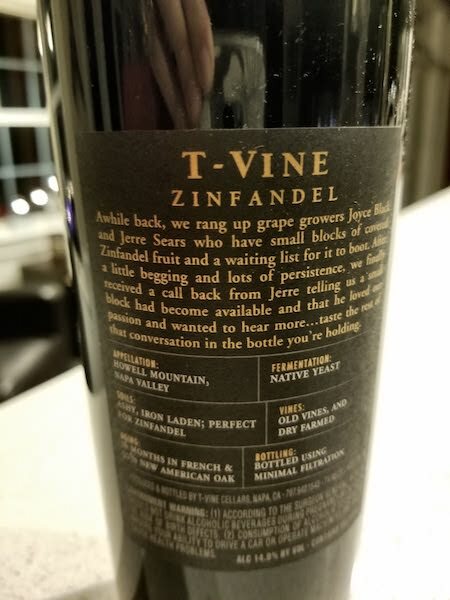 A fun way for a wine lover to celebrate an anniversary of any kind is to crack open a bottle from that specific year. 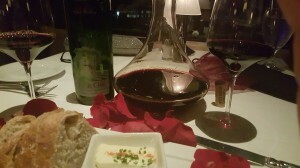 My husband and I did just that to celebrate our wedding anniversary a few nights ago. We were married in 2001, so we selected a 2001 Napa Valley Silver Oak to toast 15 years of marriage! I wasn’t sure what to expect. I feared an over-aged thin wine with no fruit. Thankfully my fears were not founded AT ALL. The 2001 Napa Silver Oak is singing right now. On the nose are cassis, cherry and some tobacco. 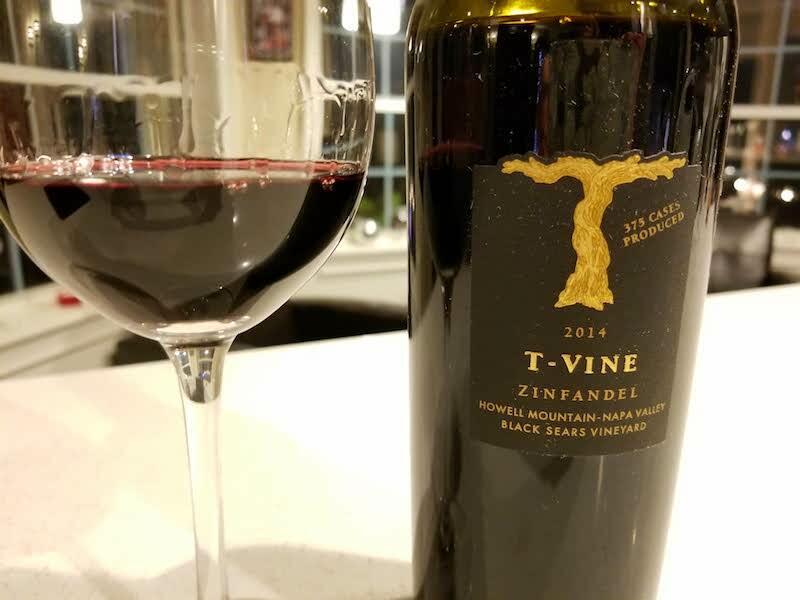 The palate reflects the fruit and has beautifully integrated tannins. We were thrilled! We may need to hunt down another bottle for our 16th anniversary! 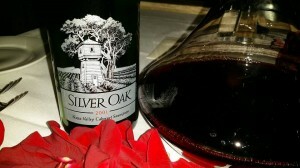 Interestingly, Silver Oak uses American oak for both their Napa Valley and Alexander Valley bottlings. The reason? They feel that American oak imparts less wood tannin than French oak! In fact, as of last year they have acquired full ownership of A&K Cooperage in Missouri. They purchased 50% in 2000, but feel that a full ownership will help them to maintain the barrel making standards they desire. I love that Silver Oak waits to release their wines. While a lot of Napa 2013 wines have already been on the shelves for months, Silver Oak is just now releasing their 2011s. I also love that Silver Oak has been using sustainable methods for 40 years! 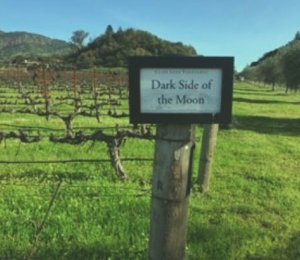 From the usage of solar, Integrated Pest Management and water conservation to obtaining multiple “Green” certifications and more, Silver Oak is one of the “good guy” wineries in Northern California.